- I wanted to head back into the canyon on Sunday and do something short and new before taking a day off to rest up for my rim to rim to rim hike on Tuesday. I decided to head to Grandview Point and drop down to Horseshoe Mesa and check out the views into Granite Gorge. - Unlike the South Kaibab, Bright Angel, and North Kaibab Trail the Grandview Trail is a little rougher and steeper near the rim. The trail is also very narrow in a couple of spots with some big drop offs. After the first mile the footing becomes much better and the grades ease up and it becomes more or less the same as the popular trails. - I ran into very few hikers throughout my hike, maybe a dozen. It was a welcome change from the previous two days. I only brought two liters of water so I couldn't spend the whole day roaming around the inner canyon. Along the way I saw some old trail junk, an entrance to an old mine, radon warning signs, and the old Horseshoe Mesa building. - I eventually made my way out to Horseshoe Mesa Point where there were incredible views down to Granite Gorge and across to Newberry Butte. I took my time throughout the whole hike, the temps probably topped out around ninety degrees but it was very windy making for an enjoyable experience. The heat out here doesn't bother me, ninety, no humidity, no mosquitos, I'll sign up for that any day back home in the summer! - On the way back from the point I bushwhacked (more like shrub-whacked) around the Horseshoe Mesa Butte. It was pretty cool going off trail, although there was a pretty defined herd path I was on for most of it. - The old Horseshoe Mesa building is a pretty cool structure, there is no roof left but it will stand forever. There are old cans everywhere in this area and just up the trail where the old mine is. Lots of rusted scrap metal around, too. There were 'Stay Out, High Radon' signs in two places. Unfortunately I went off trail and came back on trail where one of the signs were, oops! 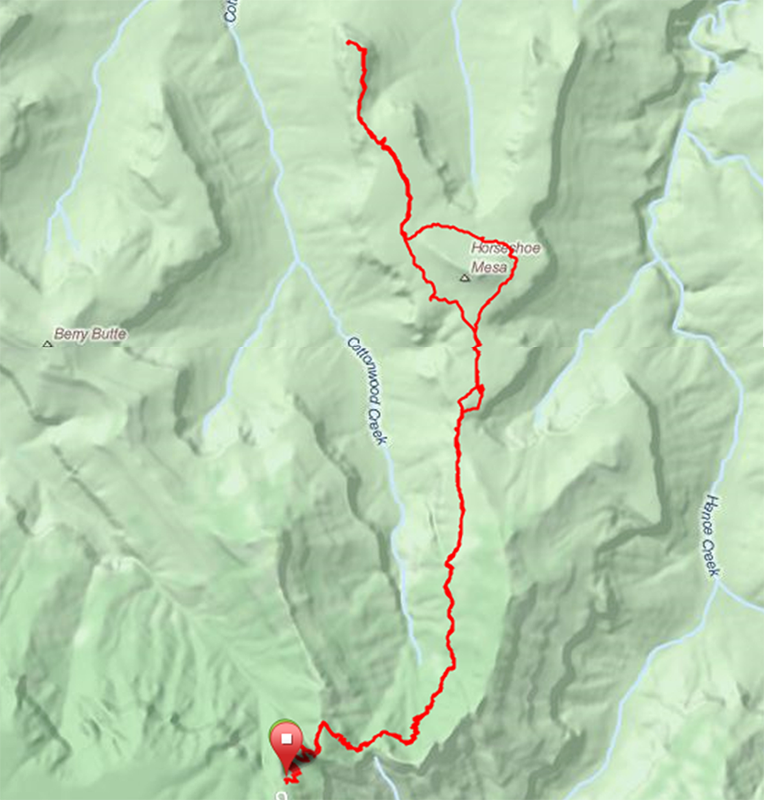 - The hike back up in the mid day sun was not too bad either, I made good time and I really enjoyed my short day out dropping down a few thousand feet into the canyon. Looks like a cobblestone trail! Narrow section of the trail! Little spooky with the narrow and rough footing!